With a star-studded high jump field like that which we saw today, somebody was bound to do something incredible. After setting the North Carolina 4A State Meet on fire with victories in the high jump (US No. 1 6-1), long jump (US No. 1 19-11.25), and triple jump (US No. 2 41-9.25), Smalls did not let her foot off the gas as she cleared a US No. 2 all-time 6-3.25 for the national championship in the high jump. Smalls is quickly becoming one of the top jumps specialists in the country after experience major breakthroughs across the high, long, and triple jumps. She won 26 times combined out of 28 tries at each distance this spring and has not done much losing this indoor season either. 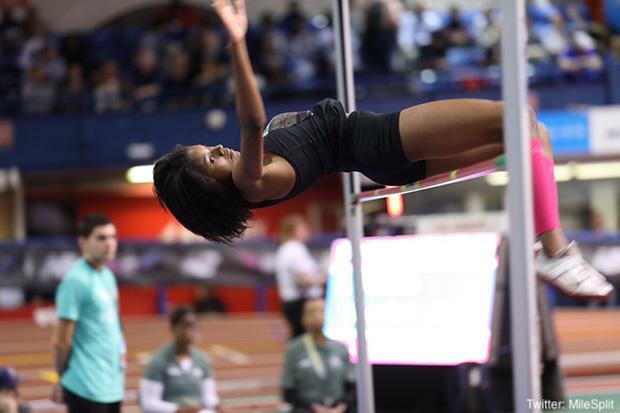 She is now second all-time in the record books for the high jump behind pro-jumper Vashti Cunningham who cleared 6-6.25 at the 2016 USATF Indoor National Championships. The road to the title wasn't easy for Smalls, though, as she had to hold off defending champion Anna Hall (CO), Nyagoa Bayak (ME), and Taylor Beard (VA), all of whom cleared 5-10.75. Smalls will compete in the long jump on Saturday and triple jump on Sunday.